Warning, Long post. Maybe settle down with a cuppa and a biscuit while you read. Well this isn't the post I thought I'd be writing when starting the Lightfast Testing earlier this year! Because of the erratic weather in Wales, I thought that my Lightfast Tests would take longer than one summer. I bought the Blue Wool Scale Cards to more easily know when the test paints had been given the right amount of light, 800 hours or more. And thank goodness I did. 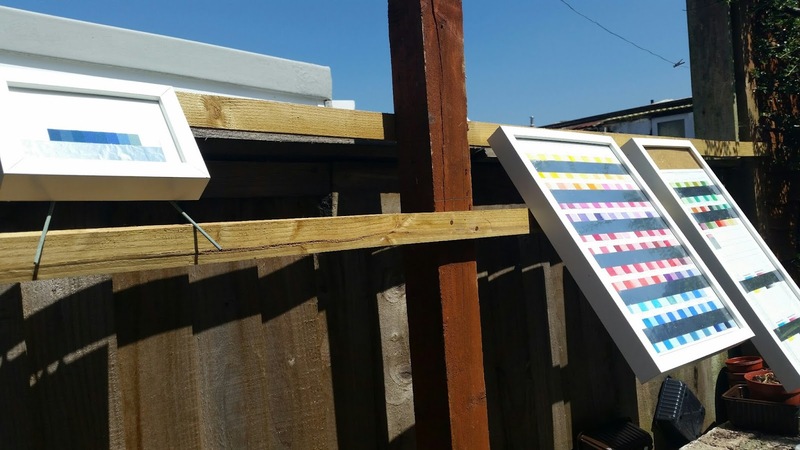 This summer was the hottest driest and sunniest in Wales since 1976 and because of this, the Lightfast Testing is now complete in just one summer ! I shouldn't be surprised really as the tests were hung outside for 126 hours roughly, though in the last few days they had to be brought in quickly when rain threatened. Add to that the tests were hung outside for 8 to 10 hours a day throughout the summer and the 800 hours was exceeded. First of all a note about Lightfastness Testing. Most people realise that paints can fade over time, but did you know that paints can change in other ways? Some can darken or become a different colour completely, though this happens less often. 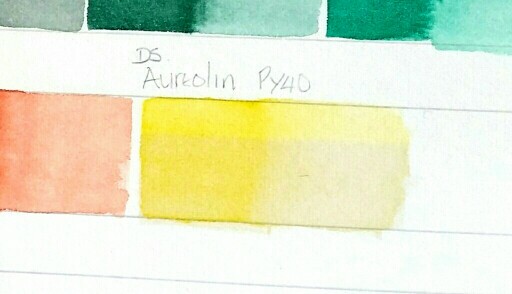 Aureolin PY40, is one of those that change colour, becoming a dirty brown very quickly indeed. 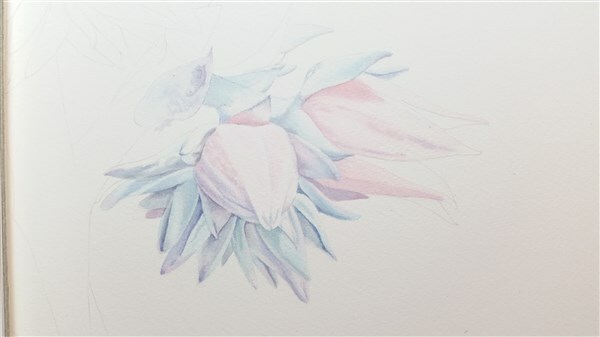 Prussian Blue PB27, is another quirky pigment, I found it faded quickly but then recovered after being in the dark and didn't change after that! 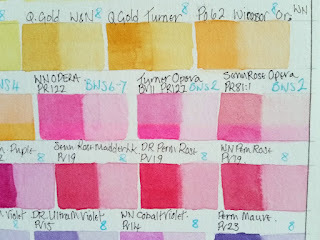 Both Rose madder Genuine NR9 and Alizarin Crimson PR83, appeared not to change for a number of weeks, then very suddenly lost colour rapidly - most easily seen in the tints, which disappeared almost entirely, but fading was also evident in the mass tone too. Lightfastness Testing is conducted to give an indication of the maximum or minimum lifespan you can expect from a specific paint colour. Some colours last just a few weeks, others last for a very long time - under favourable conditions, they can last for generations. Most of the results agreed with the manufacturers' Lightfastness declarations, but there were a few surprises, I leave the reader to work out which those were. Prices as of November 2017 were around £16 per BWS 1-8 Card (the largest number of swatches) plus postage and packing. If you live outside the UK, a google search of Blue Wool Scale Textile Fading Cards should bring up results relevant to your country. 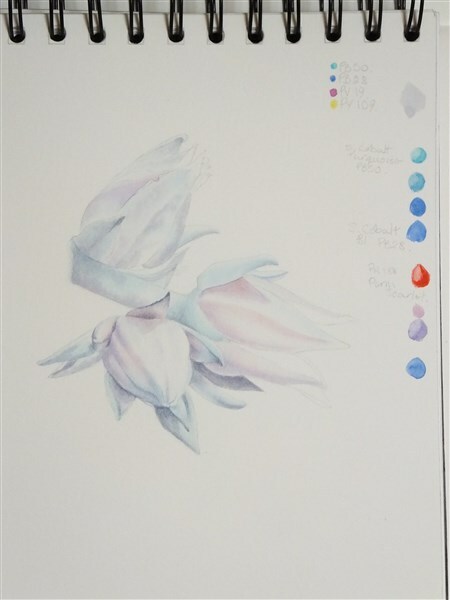 The tests were painted on Saunders Waterford Hot Press Watercolour Paper 200lb High White which has no optical brighteners. 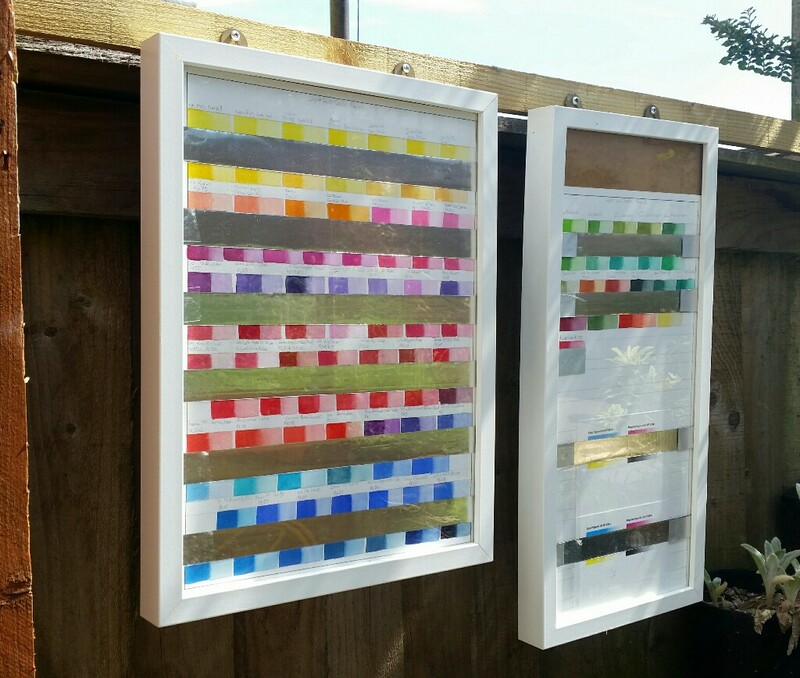 They were then put into frames with thick, double layer aluminium strips taped to the inside of normal picture frame glass to cover half of each swatch, and a good contact ensured with the watercolour paper. 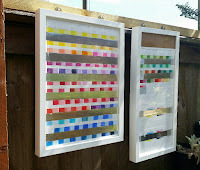 The frames were then hung outside in full sun at an angle of 45 degrees to ensure even exposure of all the paints over the whole test area. 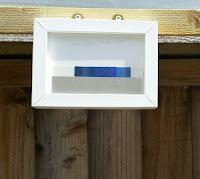 The Blue Wool Scale 1-8 card was half covered with a double layer of thick aluminium foil and also framed tightly to ensure good contact between the aluminium and the unexposed wool swatches. This was then also hung out daily at an angle of 45 degrees. When not hung outside in the sunshine, the frames were laid face down on a table and covered to ensure no other light reached the paints or the Blue Wool Card, so that the results would be more reliable. 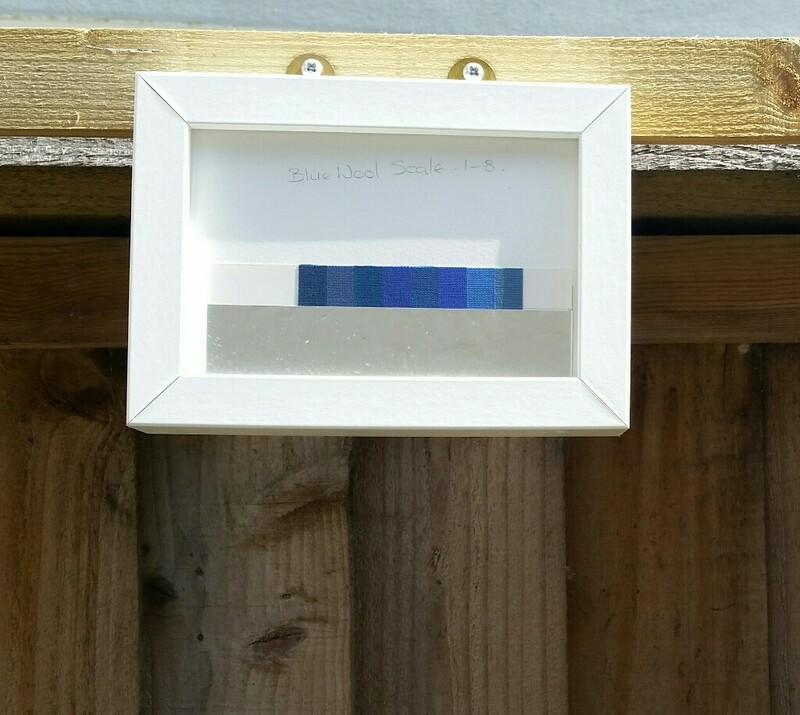 Each week the tests were checked against the Blue Wool Cards, any changes noted, compared to the Blue Wool Scale and recorded against the paint. The amount of change was also compared against the Blue wool Scale Card at the end of the test and recorded as a comparison. 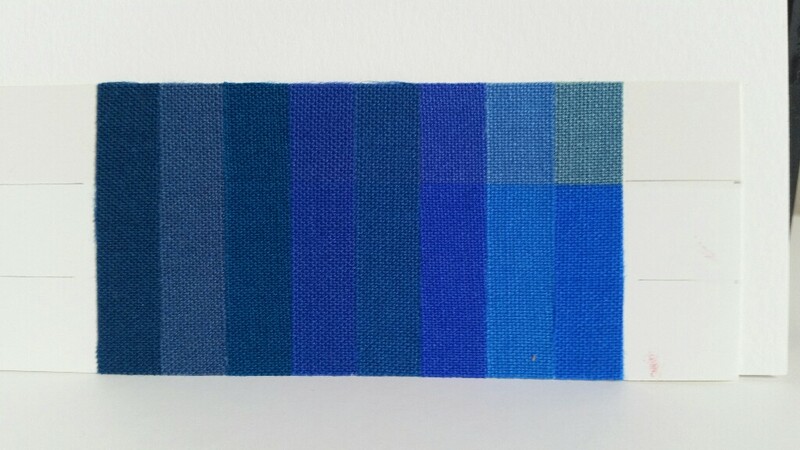 The end of the test was the point at which the Blue wool Scale 8 swatch was noted as having changed. Thanks to the glorious summer weather, this happened in a fraction of the time anticipated. 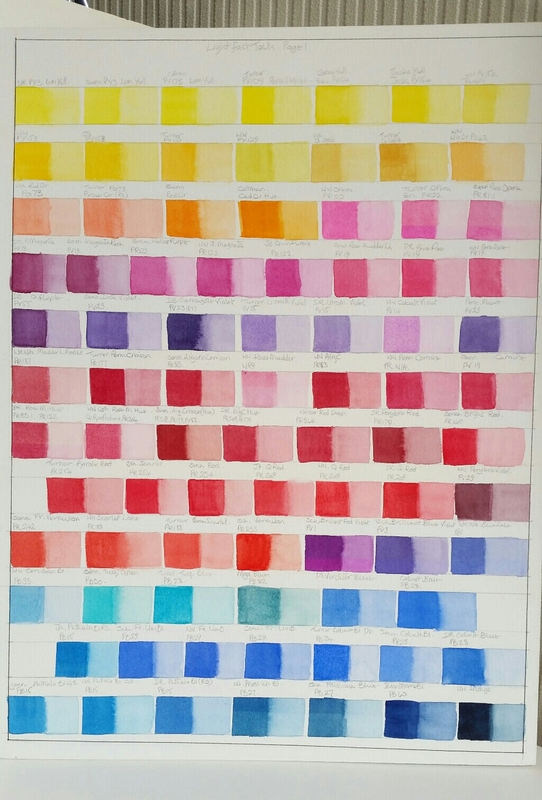 From my tests, it has become apparent that we have a wonderful selection of colours which are highly lightfast - Yellows, Reds, Pinks, Purples, Blues, Greens and Browns. These can be found in the PDF - just follow the link. If you have a problem seeing the PDF please contact me and let me know. When choosing paints, it's important to remember that the only reliable guide as to the colour is the Pigment number. 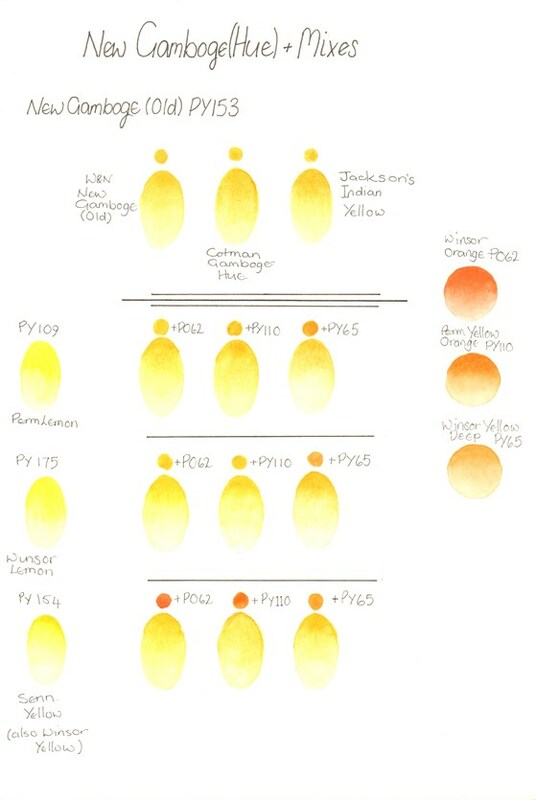 Manufacturers may give different colours the same names, or the same colours different names, or they may change the pigments and leave the name the same, but the pigment number (or numbers if it's a mixture/hue) will let you know what you are really buying. 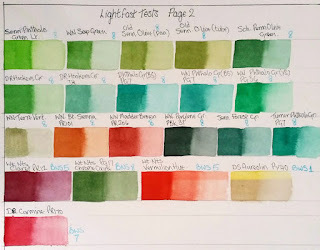 These paints are my own paints, the fugitive colours have never been used in a painting, they may have been acquired as part of a set, or bought specifically for the test, especially where age could conceivably affect the lightfastness. 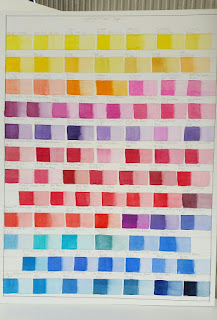 The rest are colours that are useful from time to time, apart from a core of colours which I find myself using in almost every painting. The results of the tests are my results, under the conditions in my garden this summer (2018) and using the paints and paper that I normally use, against this brand of Blue Wool Scale 1-8 Card. 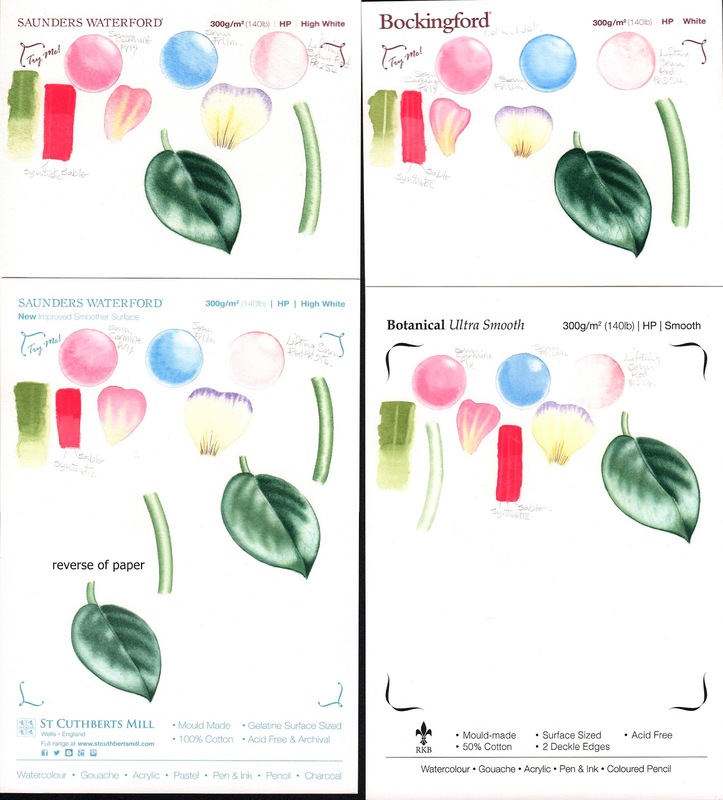 You may see different results with different paper and paint under different lighting conditions. 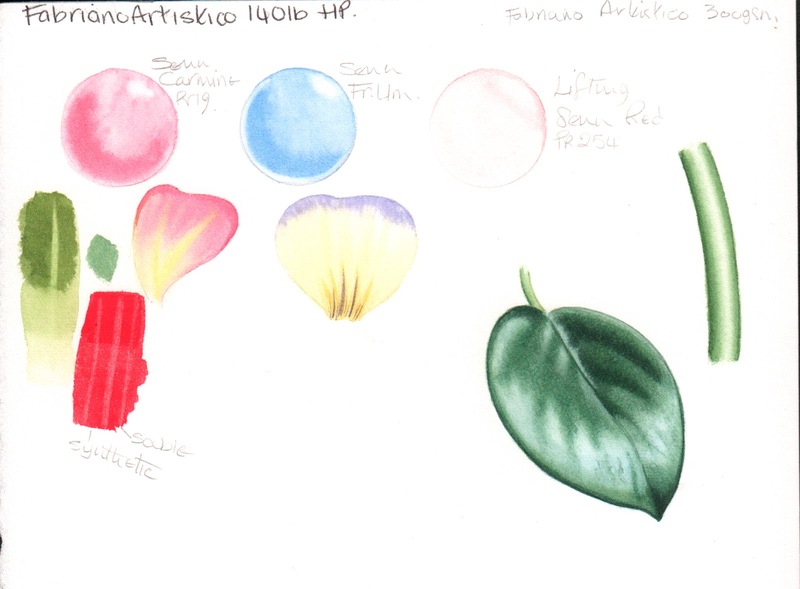 These tests were conducted completely independent of any manufacturer or provider of art supplies. In January this year I bought some Blue Wool Scale 1-8 Cards and made lightfastness charts with every watercolour paint that I have in the brands that I own. This means I sometimes have more than one example of a colour to test. I also included known fugitive colours, some accidentally acquired in sets or dot charts, and one - Rose Madder Genuine - bought for the occasion. The charts were made with swatches on watercolour paper consisting of Mass Tone and a dilution which still gave a clear colour, and the thick aluminium masks were set so that they covered half the swatch. The glass is normal picture frame glass to allow maximum light penetration. The original intention was to use a light box fitted with UV lights, but as it turned out, the tubes weren't numerous or strong enough. And my electricity meter was whizzing around far to quickly ! So, after setting up the frames and masks and putting everything together, it was all shelved in the dark until the weather was right. The past week has been dry and even occasionally sunny so the test frames have been hung outside daily, facing as close to South as I can get. I don't wait for sunshine, and hours arent counted as the light here in South Wales is so variable. Any light will do as I have the Blue Wool Scale to compare with. Interim results, at Blue Wool Scale 3 - after just 1 week are interesting. The colour most noticeably changed. It's gone dirty and brown. My advice, avoid. 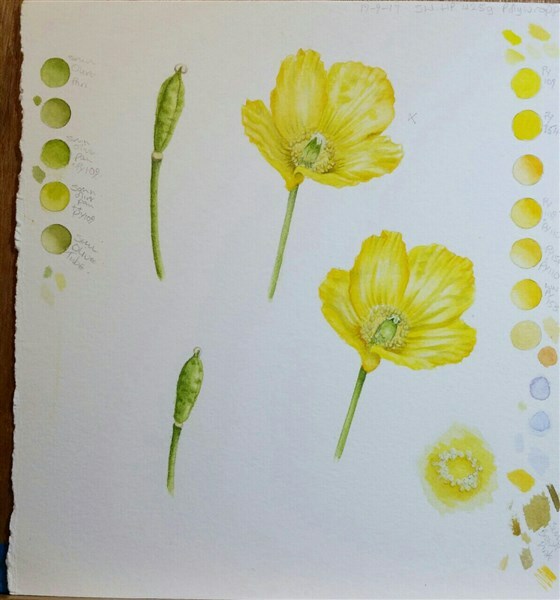 The last thing any artist needs is a yellow that goes dirty so quickly. There are plenty of lovely yellows to play with that won't change so quickly. If you're really attached to it, maybe do your own Lightfastness Testing. This is a known fugitive colour and I can't say I know of many who would use it as there are any number of non fugitive alternatives. However, it hasn't changed as quickly or as much as I expected. Watch this space. The expected has happened. The brightness has disappeared across the swatch leaving a reddish purple. It will be interesting to see how this one develops as time goes on. Both of these make no claim to lightfastness and it's clear to see why. They have faded substantially in mass tone and diluted. However W&N Opera PR122 remains bright and unchanged so far. This has shown clear changes already. Faded in mass tone and diluted. There are substitutes that won't change. This has faded substantially. If it's a favourite of yours, you may wish to do your own lightfastness Testing. 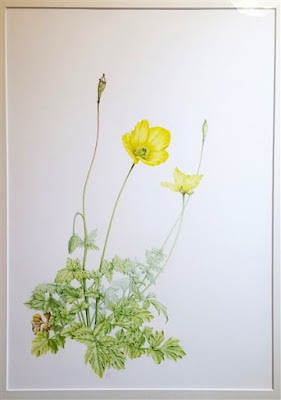 A native perennial with a taproot, even when it looks as if it’s been killed by the most severe winter, the Welsh Poppy will bounce back in the spring. And it doesn’t need much soil, being happy to grow anywhere as long as there is moisture and a little sunshine. When it came to choosing a native wild flower to paint, this elegant and delicate beauty was an obvious choice, it deserves more attention than it gets and makes a perfect subject for a watercolour painting. Luckily, I had harvested a few seeds from wild plants some years ago. I thought they were lost, but late in 2016, they started growing on the patch where they'd been sown. By spring last year, I had several small plants all showing good growth. 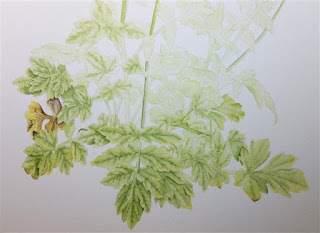 As with all my paintings, my first move was to make studies of alll aspects of the plant, starting with it's growth habit and working through all the parts - even down to the tiny hairs on the buds and parts of the stems. 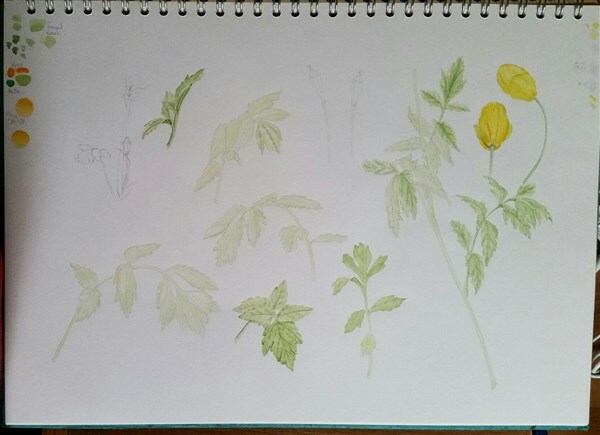 Initial studies go in my sketchbook. Later studies are done on the paper I will work on. 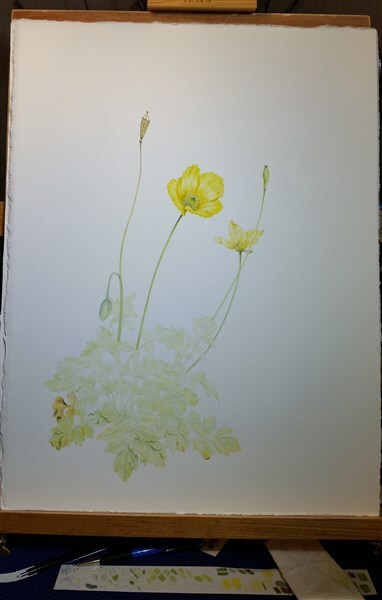 The bright yellow flowers were an enjoyable challenge. I had great fun finding the combination of yellows that would give depth and the correct colour, then working out how to portray the shadows without losing the glowing yellows. The leaves were a challenge all their own since they change colour even under daylight lamps. 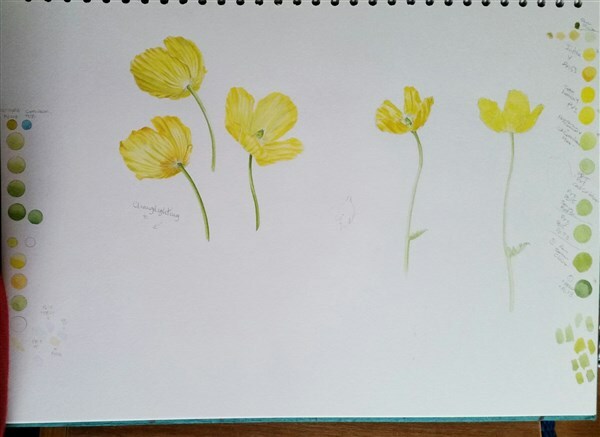 Painting them in daylight is clearly the answer, but in a cold, wet, Welsh summer, daylight is somewhat scarce and painting in the rain with watercolour not really practical. 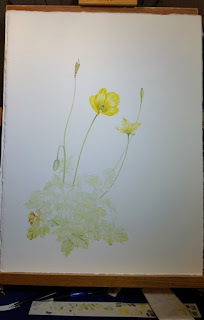 Nevertheless, needs must and it was October by the time I was able to finish the painting, grateful for the mild autumn which allowed the plants to survive longer than usual. 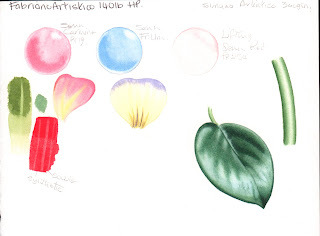 Lately, I have noticed that my favourite Watercolour paper has changed. When I can work on it, it's jolly hard work - but without the jolly bit. In fact, I have found myself with paintbrush in one hand and a brush full of gelatine size in the other. I did at first think it was me. Painting isn''t one of those things that you just sit down and do, some days it goes well, and some days you wish you were a photographer, although, I'm sure photographers have bad days too! So it was with a heavy heart that I decided that I would look for another paper to work on. I like working on Daler Rowney HP, but it only comes in 140lbs, which is ok for really small stuff, but not so good if you want to work bigger and have larger areas of paint. It cockles. And before someone tells me to stretch the paper first, yes, this works for some people, but I prefer to keep the sizing where it is, and anyway, that means I would have to keep several pieces ready prepared and stuck to boards, and since my studio space is tiny this really wouldn't work for me. There's also the problem of availablility with DR HP, it being available in sheets only from one supplier which means a two hour plus round trip - and that's if I'm lucky! So, as I was taking the trouble to test out several papers I thought it would be of interest to others and I'm putting it here, because there's quite a lot of information. 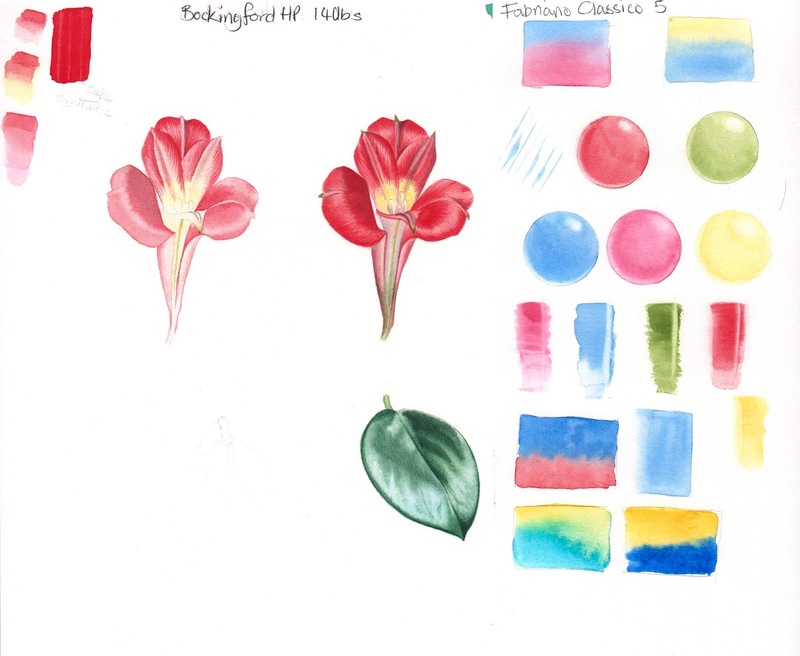 Each test was conducted with the same paints and brushes. 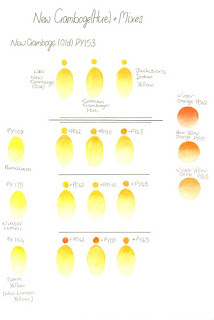 I tried to make sure the only variable was the paper, but the weather decided to get involved too and some of the tests were conducted on very hot dry days and some on very wet days, although I think the main problem that posed was drying speed so I haven't commented on speed of drying. 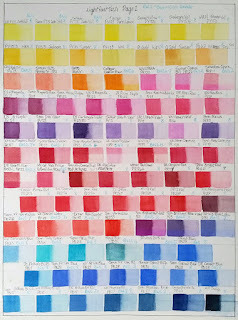 The paints - all from Sennelier - French Ultramarine(PB29) Sennelier Yellow Light (PY154 ) Rose Madder Lake(PV19) Sennelier Red(PR254) and Sennelier Olive (the old one PO49,PG36) I don't normally use ready mixed greens but this one is very useful as a base and is totally transparent. Fine surface, very smooth both sides. W-in-W Paint spread on the damp surface quickly and blurred softly. Easy to soften edges. Petal – Edge colour bled nicely, no manipulation needed. Markings fine and sharp. Leaf – W in W spread almost too much but lovely soft result and well controlled. Subsequent dry brush work also soft. Stem – paint spread from the edges nicely and a quick sweep of the brush down the middle created a nice ‘shine’ dry brush to edges softened nicely. All colours nice and bright. Reverse of paper seems easier to work on and results cleaner. Some cockling even when dry, I would love to try this in a 200lb or 300lb version. A lovely paper to work on, but lifting after drying is a problem. All colours nice and bright. Despite texture, edges clean and fine lines clean. Leaf – Needed extra work for W-in-W underpainting, but dry brushing very soft effect and clean sharp edges. Green paint lifted leaving lighter green line. Red paint barely lifted leaving a slightly lighter red. Edges clean and well defined and easy to clean up. Very smooth paper both sides. W-in-W paint spread nicely and easy to control. Edges easy to soften. Red lifted well. 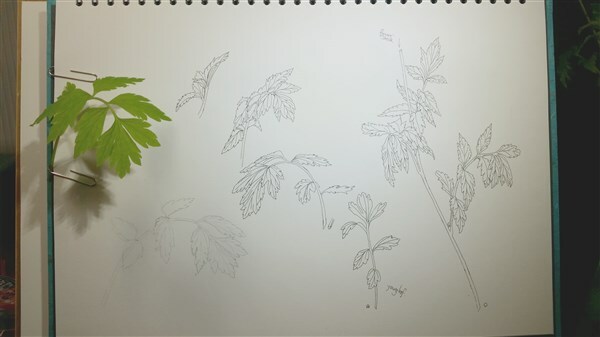 Leaf – W-in-W spread well, dry brush effect soft and deep. Edges easy to clean up. Stem – W-in-W easy to control, highlight lifted nicely . Green paint lifted leaving a clean light green line. Red lifted leaving a red line, but not sharp. Edges clean and easy to clean up. Slight texture on one side and smooth on reverse. Feels very soft to the touch. W-in-W - Paint dispersed nicely and edges softened nicely. Red paint lifted almost clean away. Petal – edge paint bled nicely, little or no manipulation. Markings fine and sharp. Leaf – W-in-W spread nicely, well controlled. Dry brush soft effect. Stem – Edges pread nicely and easy to lift shine in the middle. Darker edging easy to soften. Green paint hardly lifted. Red paint both first and second layer lifted slightly. All colours nice and bright. Texture didn’t affect clean edges or sharp details. Lovely paper to work on. Much heavier texture than most HP papers. Random texture on front and noticeable pattern on reverse. W-inW inactive paint didn’t spread much. Difficult to soften edges. Red paint lifted almost clean. Petal – Edge colour needed persuasion to soften. Fine lines needed more than one sweep. Leaf - W-in-W spread far too much, soft effect but lacked control – maybe over compensation after first three attempts? Dry brush ok, not too harsh. Stem – Took longer to persuade paint to spread, several attempts needed. Highlight present but mechanical looking. Green paint lifted a little. Red paint sat on top of paper, but clean lines when lifted but not to white. Paper cockled badly when wet but dried flat. I found this a more difficult paper to work on. Very smooth paper, felt it was very like Arches. W-inW paint spread well, but curiously when dried the colours seem faded. Difficult to soften edges and it shows! Lifting of the red unsuccessful. Petal – Edge colour didn’t spread in and not successful. Colour when dried very feint. Leaf – W-in-W spread well but colours feint and needed more than one wash. Dry brushing also needed more work. Effect soft. Stem – W-in-W needed a lot of work. Doesn’t look as effective as others. Green paint lifted well. Red paint sat on surface but lifted well, lines clear and defined, but not white. This paper is a few years old. It’s difficult to tell which side is which even with a strong magnifying glass. Both sides are very smooth and I painted on both sides too. W-in-W paint spread out nicely leaving a soft effect. Edges were easy to soften. Lifting of red was mostly successful. Petal – Edge colour spread inwards beautifully and gave exactly the right effect. Sharp lines nicely defined. Stem – W-in-W easy to control and highlight easy to lift leaving a convincing shine. Green paint lifted leaving a slight colour. Red paint was lifted leaving lighter red. Colours not quite as bright as Saunders Waterford and Strathmore, but well defined and clean. This paper is also a few years old, Both sides very smooth and difficult to tell back from front even with strong magnification. W-in-W paint spread nicely, easily controlled. Soft effect. Edges easy to soften. 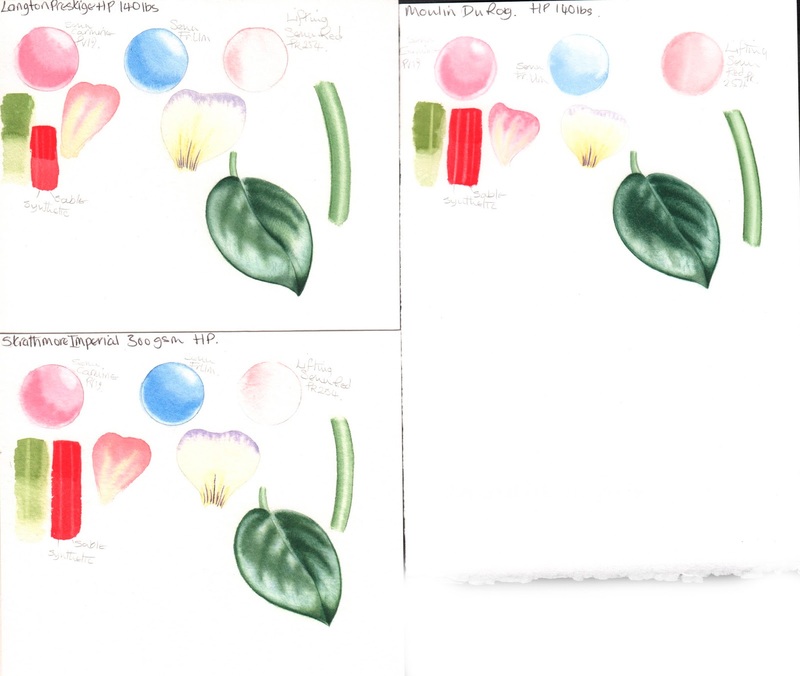 Petal – Edge colour spread inwards nicely, giving the effect wanted. Fine lines sharp and clean. Stem – W-in-W easy to control and highlight easy to lift. Green paint lifted easily leaving lighter green. Red paint lifted leaving sharp lines of lighter red. Colours not as bright as Saunders W and Strathmore but well defined and clean. Lovely paper to work on but slight cockling. W-in-W paint spreads nicely, soft edges easy to achieve. SW Bockingford HP 140lbs - this is from a large sheet. I often use this paper if I want to try out different things, or just for sketching. It's a lovely smooth paper which takes a wash nicely and also dry brushing. 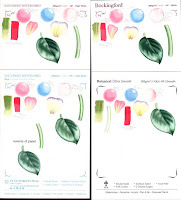 It's also very consistent and reliable which is very useful if you're sketching, as you can concentrate on what you're doing, rather on coping with variable paper. 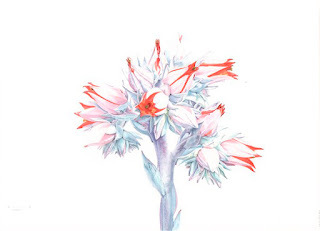 Echeveria cante - Step by step. 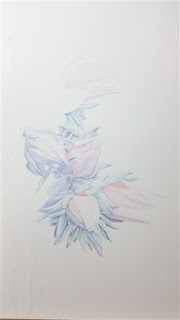 In April I wrote about this year’s SBA exhibition, and the paintings I had exhibited there. 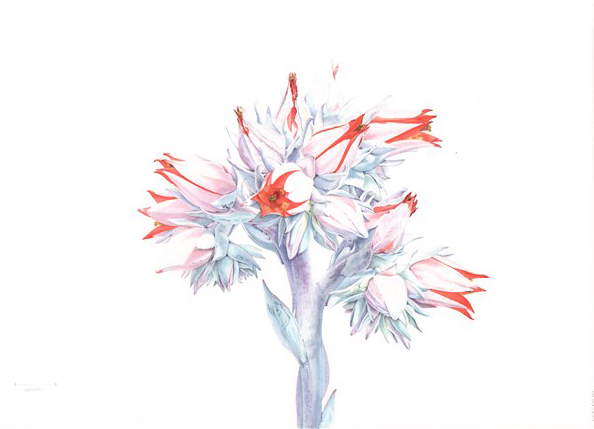 I was tremendously encouraged to be told that one of my paintings had been awarded the Certificate of Botanical Merit – the Echeveria cante. It was a wonderful plant to paint, since it's such a challenge. In full sun, the plant can be blindingly white, on dull days the plant can look grey. On the day I saw this plant for the first time, it was very sunny, and as I looked at the plant, a cloud covered the sun. In that moment, the plant came alive with colour and I knew that I must capture it for others to see. 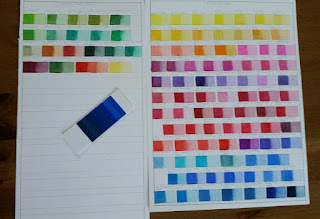 First task was to get an accurate record of the colours, using my trusty mini paintbox and travel brushes. 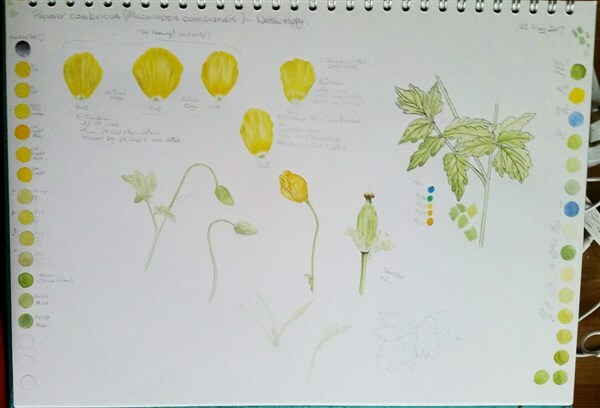 Then measured drawings and notes made of the plant from different angles in order to capture as much information as possible. 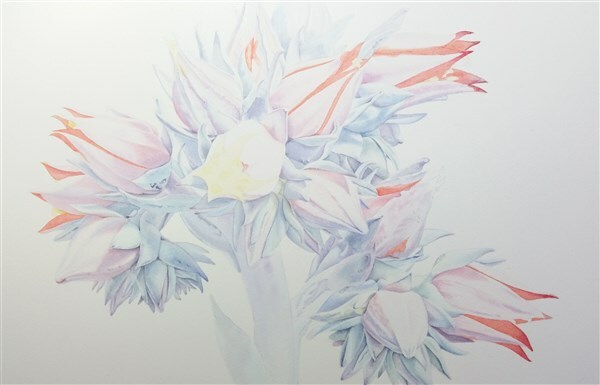 Once back in my studio, I decided on a small study, in order to work out how to render the colours and textures and work out which colours and colour mixes would best express the glowing quality of the plant. In this case, I decided on Cobalt Turquoise and Cobalt Blue as the Blues for the palette, as I felt they had just the qualities I was looking for. Once I was happy with the choice of colours, I made an inked copy of the composition on tracing paper. 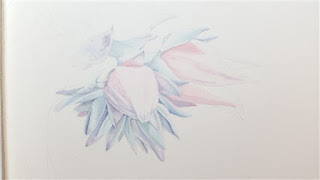 This is used to transfer the composition to the watercolour paper via a lightbox, and is also insurance against having to start the painting from scratch in the case of disasters - flying brushes usually! Echeveria cante - Growing nicely! At first, the washes were laid in very lightly. I wanted to make sure that I kept the tones light at this stage, and for the same reason the reds were left until last- deeper and brighter tones would add punch, but would not reflect the delicate colours and textures of the plant. I decided to work in stages so that I could keep already painted areas clean by covering them as I worked. 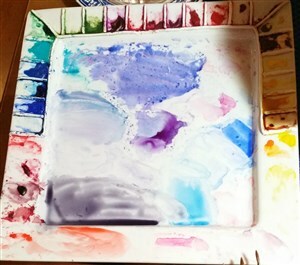 At this stage, this is what my palette looked like. I tend to mix on the fly once I have chosen my colours. This ensures plenty of variety in the colours of the painting and keeps me on my toes matching colours to the plant. The grey at the bottom is mixed from the colours in the painting - in this case, Cobalt Blue, Permanent Magenta and a Transparent Lemon. This grey is then used to increase the range of tones in the painting and is also used for the very darkest areas - tiny areas of dark that help to lift the whole painting. Once I was happy with the colours and tones of the main part of the inflorescence, it was time to lay in some of the reds. A light wash of yellow went on first, which helped the more orange reds to glow nicely. 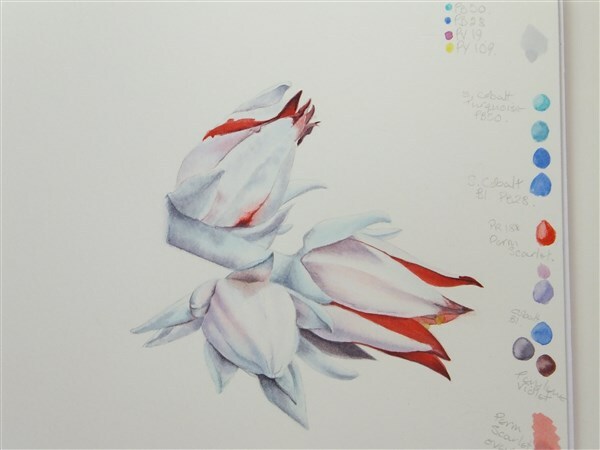 Then, the different reds were painted in - lightly at first so as not to overpower the rest of the plant. Now it was time to add the stem, and reassess all of the colours. 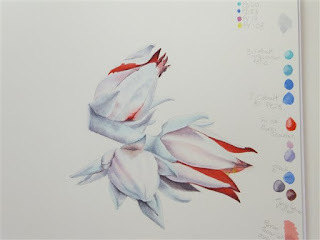 The details of the Stamens and Carpels were left until last and added a final touch of realism to the painting. 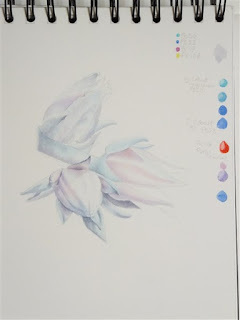 I hope this Step by Step has given some insight into how this painting evolved and the techniques used to finish it. Next up - Paper testing! 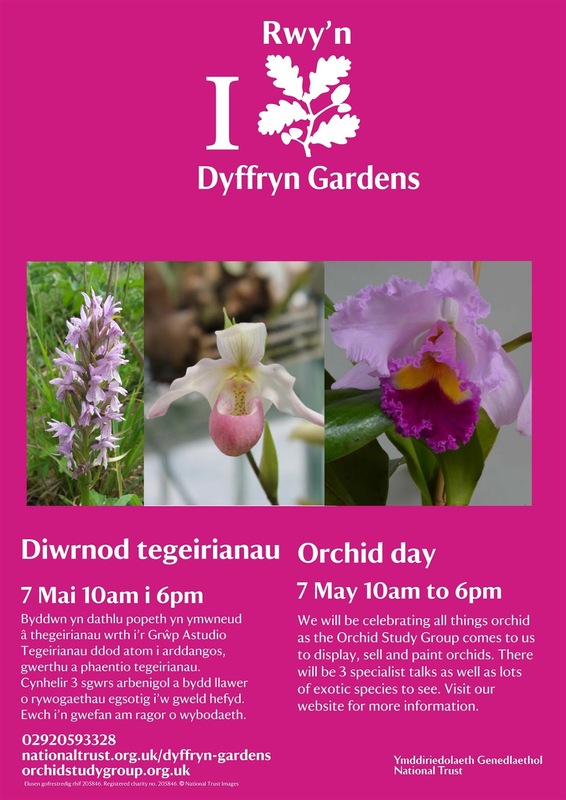 On 7th May 2016 the Orchid Study Group will be in Dyffryn Gardens for Orchid Day - a celebration of all things Orchid - Tropical and Native Orchids. 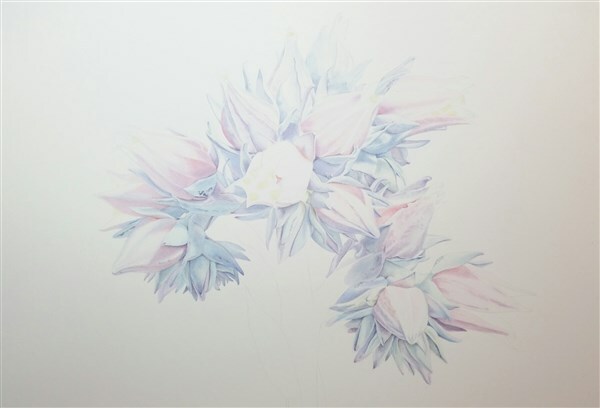 I will be there too, demonstrating how I paint orchids in watercolour. Do come along for a wonderful informative day out in the most beautiful surroundings of Dyffryn Gardens.